As promised, here are some more environmental time-progression satellite data which were posted by Valery35 at the Google Earth Community during the past few days. In this collection, we start with the corresponding data to the Day Land Temperatures of the Earth now with the Night Land Temperatures. In addition, Valery posted data on the Biosphere, Leaf Area Index, and Vegetation Index. Once again, all of this data came from NASA's Moderate Resolution Imaging Spectroradiometer (MODIS) satellites Terra and Aqua. The data is shown here as image overlays draped over the satellite photos on Google Earth. Open each Google Earth file and then open the folders for each year and you will see the months which contain each image overlay. If you turn on an entire folder it will load all the images in that folder at once - it is better to turn on and off each month. 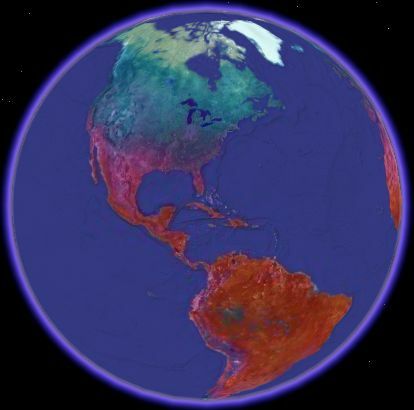 You can see the progression of temperture, the biosphere, and vegetation during the seasons. You may even notice how the environment has changed during the past few years. Valery hasn't created videos to show the time progression like he did with the Day Land Temperature data. But, someday Google will hopefully release a time-progression feature in Google Earth. We will then be able to look at this data as an animation. Este nuevo programa ayudara mucho a la geografía mundial ya que cuenta con dispositivos de ultima tecnologia.